The Party Is Ending: IMF Warns The Coming Risks Are "Clearly To The Downside"
Things are good... for now. They won't last. That's the TL/DR summary of the latest IMF World Economic Outlook report released this morning. Like the last Financial Stability report, released in October, the sunny headline numbers - which show that global economic growth is expected to continue expanding over the next two years before the advent of the next slowdown some time after 2020 - conceal signs of growing concern buried deeper in the report. But while the IMF modestly raised its growth forecasts for developed economies over the next two years, US fiscal policy is expected to soon turn contractionary in advanced economies for 2020–22 and more clearly contractionary in 2023, "when the investment-expensing provisions of US tax reform begin to expire." Worse, the momentum will eventually slow - and then reverse- leaving countries with a challenging outlook over the medium term. Financial conditions are expected to tighten naturally as output gaps close and monetary policy normalizes. But crucially for the US, "tax reform will subtract momentum starting in 2020, and then more strongly as full investment expensing is phased out starting in 2023; and China’s transition to lower growth is expected to resume as credit growth and fiscal stimulus diminish." 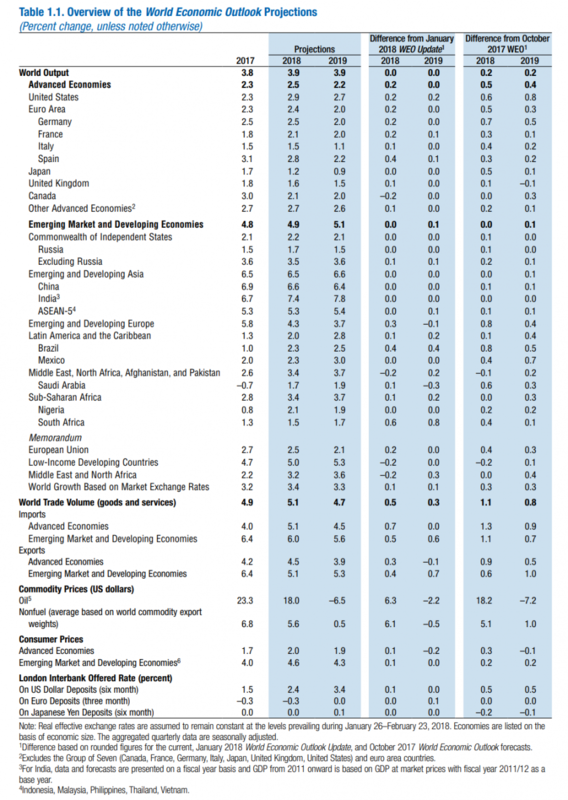 "Global growth is on an upswing," the IMF says in its executive summary. "But favorable conditions will not last forever, and now is the moment to get ready for leaner times."